It has been wonderful for the choir to receive support in the purchase of new music for out repertoire recently. We are always looking to extend our library with good new music. The men in the Choir love the challenge of learning pieces, and are currently working on some songs and styles which are new to them. Music generally costs in the region of 1.75 to 2.25 per copy, although some are a little less, and we need around 90 copies of each piece. Obviously all support is very gratefully received. If anyone feels they would like to help Mousehole purchase some new music Stephen Lawry, the musical director, would be delighted to hear from you. In acknowledgement of the support we will put the name of the donor on each copy, and try to include their name in the programme at concerts for the first year in which we use the piece. 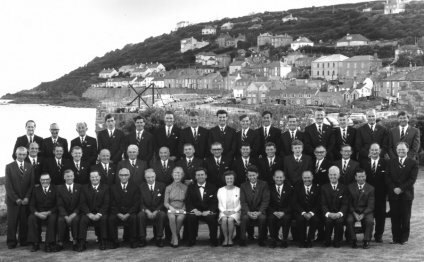 You can contact Stephen through the Choir's e-mail address info@mouseholemalevoicechoir.com or by phone on 05. Do you fancy singing in a male voice choir? You may be browsing through our website because you are contemplating joining a male choir, and dont know what to do about it. If that is the case then you have found the right place! Any man, from teenage upwards, of any age, will find a warm welcome with us. As long as you can sing in tune, you will be able to fit in somewhere in the Choir. Whether your voice is high, low or somewhere in between, we will help you feel at home. We enjoy ourselves and we would like you to come along and enjoy it too! Our practices are at 7.30pm each Monday, and you can either come along and listen, or sit in and have a go, if you are keen to join. Stephen Lawry conducts the Choir, and if you would like to have a chat with him about singing before you come then do give him a call on 05. Don't just think about it, come along and have a crack at it!